The annually reconstructed Q'iswa Chaka ("rope bridge") in the Quehue District is the last of its kind. Inca rope bridges are simple suspension bridges over canyons and gorges and rivers (pongos) constructed by the Inca Empire. The bridges were an integral part of the Inca road system and exemplify Inca innovation in engineering. Bridges of this type were useful since the Inca people did not use wheeled transport - traffic was limited to pedestrians and livestock - and they were frequently used by Chasqui runners delivering messages throughout the Inca Empire. The bridges were constructed using ichu grass woven into large bundles which were very strong. Part of the bridge's strength and reliability came from the fact that each cable was replaced every year by local villagers as part of their mit'a public service or obligation. In some instances, these local peasants had the sole task of and repairing these bridges so that the Inca highways or road systems could continue to function. Repairing these bridges was dangerous, as those performing repairs often met death. An Inca author praised Spanish masonry bridges being built, as this rendered the need to repair the rope bridges moot. The greatest bridges of this kind were in the Apurímac Canyon along the main road north from Cusco; a famous example spans a 148-foot gap that is supposed to be the inspiration behind Thornton Wilder's 1928 Pulitzer Prize winning novel The Bridge of San Luis Rey (1927). Made of grass, the last remaining Inca rope bridge, reconstructed every June, is the Q'iswa Chaka (Quechua for "rope bridge"), spanning the Apurimac River near Huinchiri, in Canas Province, Quehue District, Peru. Even though there is a modern bridge nearby, the residents of the region keep the ancient tradition and skills alive by renewing the bridge annually in June. Several family groups have each prepared a number of grass-ropes to be formed into cables at the site; others prepare mats for decking, and the reconstruction is a communal effort. The builders have indicated that effort is performed to honor their ancestors and the Pachamama (Earth Mother). Lashing the hand-ropes to the main side cables. Trimmed mat rolls form the bridge deck. The new bridge is now complete and in use. Bridge in use during the rainy season. ^ Brown, Dale (1992). Incas: Lords of Gold and Glory. New York: Time-Life Books. p. 98. ISBN 0-8094-9870-7. ^ Atlas Obscura (June 10, 2013). "The Last Incan Suspension Bridge Is Made Entirely of Grass and Woven by Hand". Slate. Retrieved April 10, 2018. ^ Squier, Ephraim George (1877). Peru: Incidents of Travel and Exploration in the Land of the Incas. New York: Harper Bros. p. 545. Each bridge is usually kept up by the municipality of the nearest village; and as it requires renewal every two or three years..."
^ Brown, Dale (1992). Incas: Lords of Gold and Glory. New York: Time-Life Books. p. 68. ISBN 0-8094-9870-7. ^ Leonard, Jonathan Norton (1968). 'Ancient America', Great Ages of Man Series. Time/Life Books. p. 185. ^ Squier, Ephraim George (1877). "The Great Hanging Bridge Over the Apurimac". Peru: Incidents of Travel and Exploration in the Land of the Incas. New York: Harper Bros.
^ Foer, Joshua (February 22, 2011). "The Last Incan Grass Bridge". Slate. Chmielinski, Piotr (1987). "Kayaking the Amazon". National Geographic Magazine. 171 (4): 460–473. Finch, Ric (2002). Keshwa Chaca: Straw Bridge of the Incas. South American Explorer. Ithaca, NY. pp. 6–13. Gade, D. W. (1972). "Bridge types in the central Andes". Annals of the Association of American Geographers. 62 (1): 94–109. doi:10.1111/j.1467-8306.1972.tb00846.x. Showed the bridge at Huinchiri and predicted the art of building it would be lost within another generation, which proved untrue. Hurtado, Ursula (publication date unknown). "Q'eshwachaka: El Puente Dorado". Credibank. Peru). pp. 22–23. Describes the documentary film directed by Jorge Carmona. McIntyre, Loren (1973). "The Lost Empire of the Incas". National Geographic Magazine. 144 (6). pp. 729–787. McIntyre, Loren (1975). The Incredible Incas and Their Timeless Land. Washington D.C.: National Geographic Society. "Secrets of Lost Empires: Inca". Nova. PBS. 1995. Von Hagen, Victor (1955). Highway of the Sun. New York: Duell, Sloan and Pearce. p. 120. 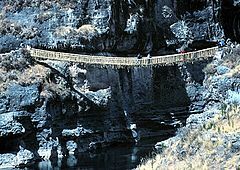 Wikimedia Commons has media related to Incan rope bridges. "Inca Bridge to the past". Boston University. March 21, 2003. "Inca Bridges, a Library of Congress lecture". Library of Congress. "Inca Roads and Chasquis]". Discover-Peru.org. Klosterman, Doug (Photographer). "Slideshow of Keshwa Chaca (Inca rope bridge construction near Huinchiri, Peru)". dojoklo.com. "The Last Inca Suspension Bridge: A Photo Album". Rutahsa Adventures adventure travel.